As a fashion retailer, competition can be fierce in the ecommerce space – which made us wonder, how are the cream of the crop pulling it off? To find out what elements are helping the top 50 fashion ecommerce sites succeed, we conducted three pieces of research to gather insight into their website, SEO metrics, and audience. First, we had expert user experience (UX) strategist and Interaction Designer at Corra Jessica Stoilkovic audit a top ecommerce website and point out the pros and cons of the design, layout, and buying triggers. Next, we researched SEO stats to compare top sites based on traffic rates, referrals, and bounce rates. Then, we sought feedback from the piece of the puzzle that matters most: customers. 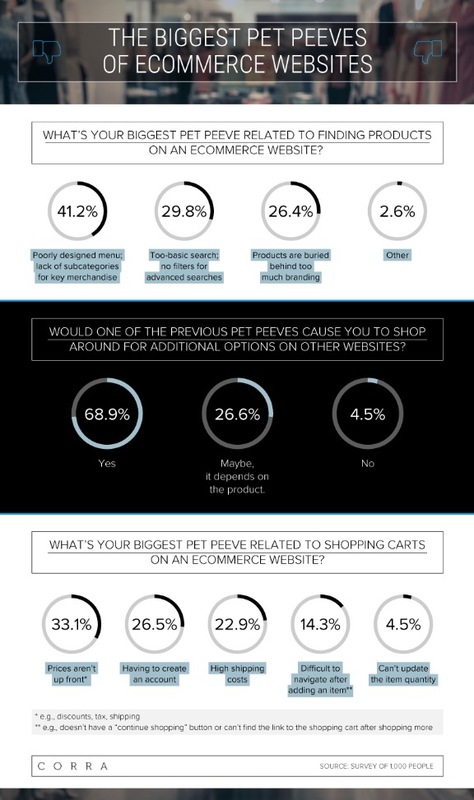 We surveyed over 1,000 shoppers to find out what they really think about ecommerce sites. With these three perspectives, we gathered insight about the elements that help leading ecommerce sites succeed and what elements you can recreate to find more success on your site. Continue reading to learn more. For the site audit, we asked UX expert and Interaction Designer at Corra.com Jessica Stoilkovic, to review leading fashion ecommerce website H&M. She analyzed and commented on dozens of pages and site elements to highlight what H&M is doing right, what they are doing wrong, and what they could improve. The review starts at the homepage and ends at the checkout to portray the buyer’s experience from start to finish. As you go through the site audit, use the comments to identify mistakes and opportunities for making improvements on your ecommerce website. The red comments indicate a critique suggestion for the site and the green comments point out what you should be doing on your site too. Use the arrows to navigate through the presentation below. PART 2 – WHAT DO CONSUMERS THINK? For the second section of our research, we went directly to the perspectives that matter most. We asked over 1,000 customers to share the highs and lows of their experience with ecommerce websites. Customers have a strong preference when it comes to what industry they think has the best websites. 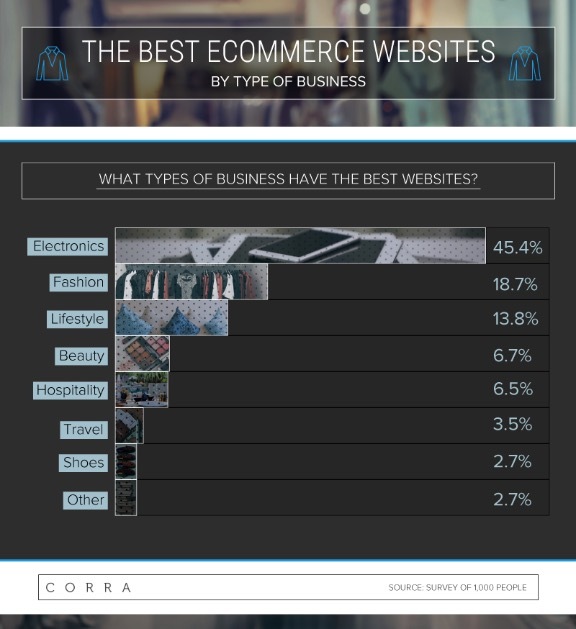 Almost half (45%) said that electronic businesses have the best websites. Next, customers prefer fashion (19%) and lifestyle (14%). To ensure customers don’t leave the page to find an alternative, ecommerce sites must address the main pet peeves that cause users to flee. Our findings highlighted the importance of addressing concerns online shoppers have with ecommerce websites. Nearly 30 percent of respondents said experiencing an annoyance on a website would cause them to shop on other websites. Utilize a well-designed, organized main menu that includes categories for all key merchandise. Poorly designed menus that missed main product categories were a pet peeve for over 41 percent of participants. Don’t hide extra costs, such as tax and shipping. Thirty-three percent of survey respondents said not displaying prices upfront frustrated them during their purchase process. Help your customers find what they want and need by providing advanced search features. Nearly 30 percent said one of their biggest pet peeves on an ecommerce site was the lack of advanced search features and search fields that were too basic. Addressing issues that frequently annoy online shoppers can help keep users on the site and stop them from looking for options elsewhere. Digital shoppers have almost unlimited options when it comes to choosing ecommerce sites, and they use that latitude to their advantage. Our research shows online customers actively seek out sites that provide the best experience, customer service, and price. They pay attention to true reviews and social media mentions, not pushy advertising tactics. They remember popular sites and positive experiences and often travel to these sites intentionally through direct traffic. To compete in the ecommerce field, consider these findings and follow the examples of the leading fashion ecommerce sites. Utilize best practices as they relate to website layout, SEO, and presentation and strive to offer the best customer experience, deals, and prices in your industry to deliver the ecommerce experience digital shoppers demand.